Vanaõue holiday centre is located on the riverside by the Vändra-Mudiste (Suure-Jaani) road. That’s where the Sakala road starts, where C.R. Jakobson walked from the editor’s office of the Sakala newspaper to his homestead in Kurgja. On the other side of the river, vast marshes and bogs take over; Soomaa National Park is also nearby. 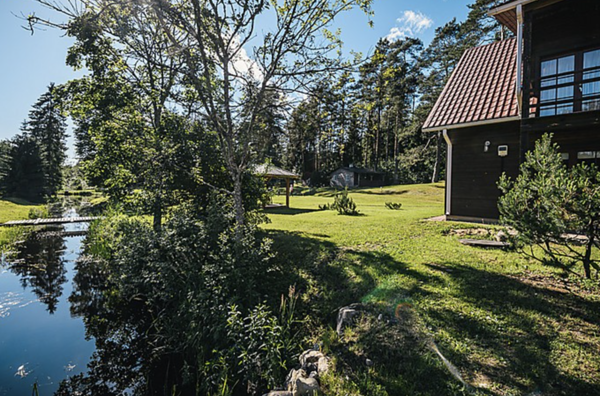 Vanaõue holiday centre offers you both a relaxing vacation from the city noise as well as an active holiday to banish stress. Our service list is versatile. Our Finnish sauna with its comfortable fireplace hall offers an opportunity to relax and have a great time with your friends. Suitable drinks and snacks can also be arranged there. The second sauna is a traditional Estonian smoke sauna, which is located right on the riverside. The sauna house dates back to the beginning of the last century. A smoke sauna is characterised by a distinct aroma and an especially relaxing effect. Our two suites guarantee a comfortable stay: the second floor suite offers an opportunity to enjoy the river view from a whirlpool bath and the spacious suite on the first floor with its handcrafted furniture awaits you with a relaxing sauna. Those interested in an active holiday can hike in a unique landscape (Navesti Nature Reserve), which combines a bog community and sand drifts. We also organise longer walking and cycling tours to Soomaa National Park. The versatile Navesti River enables us to organise canoe trips on both a beginners’ route as well as a more challenging route for the more experienced visitors. For those interested in sports, our services also include ATV tours, archery, paintball and adventure games, which are organised in the dark as well. The main building includes two halls, which offer the opportunity to hold conferences with modern equipment, organise joyful dance evenings and also indulge in the delicacies of our kitchen, including the house specialities of locally raised trout or lamb. On pleasant summer evenings, it is nice to grill in our barbecue hut. A successful South-Estonian tourism object/project 2007 "Ehe Lõuna-Eesti"